Romanian born Daniela Pop Buia who completed her Leaving Certificate studies in June last, has been awarded the 2014 Burke Oil Bursary Award for €1,000. 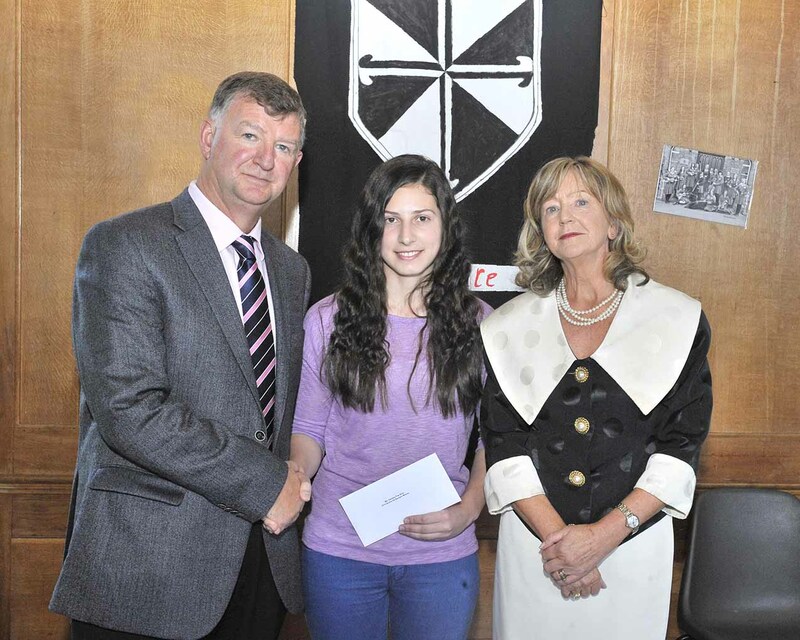 At the presentation of the award Ms. Mary White retiring Principal of the Dominican College Wicklow said that “Daniela had been an outstanding student, diligent in her application to her studies and was always enthusiastic. She was an outstanding example of what can be achieved by any student who has the same approach to their studies as Daniela”. Ms. White on her own behalf and that of all the staff and pupils wished Daniela all the best with her future studies. Daniela will now pursue her Third Level studies in University College Dublin where she is studying French and Business. Ms. White thanked Burke Oil for their long standing generous association with Dominican College as this was the 9th year that this Bursary had been awarded by the company. Daniela was presented with the award by Mr. Pascal Burke from Burke Oil after the mass celebrating the start of the new school year held in Fatima Hall recently.